The oldest firearm ever found in Sweden is a small bronze gun named Loshultbössan . It's dated to the mid 1300s. It was found in a peat bog in the southern parts of Sweden in 1861 - just a few miles into what before the year 1658 used to be Danish territory. The gun is 310 mm long, and the calibre is 30-36 mm. Knallbössan is of the same age, it was found in the harbour of Stockholm some years ago. This gun is made of steel, 128 mm long and the calibre is 8-10 mm. In the battle of Brunkeberg in 1471 the Danish King Christian I lost a couple of teeth when he was hit by a bullet fired from a Swedish musket. In the Russian war of 1555-57 most Swedish shooters were armed with muskets instead of crossbows. In the Seven Year War (1563-70) against Denmark, about half of the Swedish Infantry was equipped with musket, the rest used pikes. But when Erik XIV was dethroned in 1568 almost all infantrymen had muskets. Foot-soldiers with musket and no pikes worked well against the Russian Infantry in the many Russian wars between 1570 and 1595, but caused a disastrous loss against the heavy Polish Cavalry in the battle of Kirkholm in 1605. The pike was then put back in service and stayed for more than a hundred years. Soon after Gustaf II Adolf had intervened in Germany, at the first battle of Breitenfeld (1631), the Swedish army won a decisive victory over the Catholic Holy Roman Empire's army. The Catholic foot soldiers were armed with heavy (7-10kg) arquebusiers while the Swedish infantry used much lighter muskets (5kg) that could be fired three times as fast as the enemy's. Somewhere between one forth and half of the Swedish infantry men were equipped with muskets, the rest carried pikes. The Swedes also had much lighter guns. The range was no more than 300 metres, but they were easy to handle and the rate of fire was actually higher than for the muskets. Even though every infantryman had a musket, and every cavalryman had a carbine and two pistols, the Carolian Army (1676 - 1720) relied heavily on edged weapons such as swords, pikes and bayonets (the later introduced in 1697). The soldiers were trained not to shoot till they could see the whites of the enemies eyes, and as soon as they had fired one round they charged. They never used such unmanly tactics as volley-firing or circulating formations (caracole). In 1689 King Karl XI ordered that the local Drill-officers should keep a record of who possessed and not possessed firearms in his area, so that the good King could help to arm the unarmed. The Drill-officer should exercise all fit male in the use of firearms and also fine people who didn't take proper care of there own weapons. In the 1500s arms were made by local blacksmiths, as a kind of moonlighting. The payment was often a tax reduction or a small cottage. Firearms were often imported from Europe. In the early 1600s king Gustav II Adolf ordered that every blacksmith should deliver a certain amount of arms each year. The local Sheriff was to decide how many and when. A gunsmith could make 40 musket a year. The Sheriff should collect and inspect weapons, and then send them to Stockholm. Due to bad communications the deliveries were often late or irregular. In 1620 the same King decided that the best blacksmiths should move to certain towns, and work there. Such towns as Örebro, Arboga, Jönköping, Sundsvall, Söderhamn, Norrtälje and Norrköping. The blacksmiths and gunsmiths still worked in their own workshops, but a kind of cooperation was established. Farmers delivered stocks as a form of tax. Gunsmiths were paid for each lock they made. A " Faktor " was responsible for the assembly of arms. These loosely bonded organizations were called " Faktorier ". All firearms were proof-fired in the presence of an Inspector from the War-administration, before they were accepted. The state arsenals did not have monopoly and a lot of weapons were still made by privately owned works. Some more exclusive weapons were made by independent gun smiths in Stockholm. During the end of the Thirty Year War (1618-48) the annual production of musket was 15000 - 20000 in the whole Kingdom. In the 1700s the state arsenals (" Faktorier ") were better organized, the blacksmiths in these towns were forced to work for the arsenal. During the Great Northern War (1700-21) the annual production at each of the seven state small arms arsenals was between two- and ten-thousand musket. By 1840 the only remaining rifle factories were; Norrtälje, Husqvarna and Carl Gustaf. Large scale production begun in 1530 by the help of foreign gun makers. Production and quality increased during Gustav II Adolf's reign - much thanks to Walloon iron-workers that imigrated from Holland. By the mid 1600s Sweden made 30-40% of all cannon produced in Europe. During the Carolian period the Swedish Army got most of their artillery pieces from four state arsenals, Åkers, Nävekvarn, Ehrendal and Stavsjö. But the major export company was the private-owned Finspong, at one time the largest exporter of cannon in Europe. By the time of 1860 Finspong was the only reminding gun manufacturer in Sweden. In 1880 Finspong got competition from Bofors. Being a small country, Sweden could only support one gun-manufacturer in the long run. Due to older methods of production Finspong lost the the battle. Founded by the Crown in the 1560s. Located to the town of Arboga. Production of muskets and armour. Located to the town of Eskilstuna. In 1771 a tax-free zone for blacksmiths was founded in "Karl Gustafs stad" - the town of Karl Gustaf (named after king Karl X Gustaf) - also known as the town of Eskilstuna. After the loss of Finland in the Russian war of 1809, the Swedish arms industry was reorganized, and a new rifle-factory was founded in the town of Carl Gustaf. In 1943 it became a part of FFV, and different names have been used ever since; GevärsFaktoriet (GF), GF-vapen, Carl Gustaf (CG), FFV-Carl Gustaf. It was bought by Bofors some years ago (Bofors-Carl Gustaf). Located to the town of Jönköping. When the waterfalls at Jönköping started to dry up the water-driven mills were moved to nearby Husqvarna. Later on more and more of the resources were relocated to Husqvarna. During he Great Northern War (1700-21), Husqvarna/Jönköping gevärsfaktori was the largest of the seven state armouries, with 1000 employees and an anual production of 11000 firearms. In 1795 the last parts of the Jönköping armoury were moved to Husqvarna. Located to the town of Huskvarna. In 1689 a millingworks for rifle bores was founded at the waterfalls at Husqvarna, it later became a rifle-factory. It was privatized in 1757 and became a limited company in 1867, as Husqvarna Vapenfabriks AB (HVA). After the Danish-Prussian War of 1864 and the Franco-Preussian war of 1870-71, military orders dropped. To survive Husqvarna begun making hunting rifles in 1877. Later they also started to make motorcycles, chainsaws and sewing-machines. 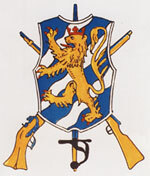 The small arms division was sold to FFV (Carl Gustaf) in 1969, and production moved to Eskilstuna in the early 1970s. Made extremely few weapons. Only a handfull rifles are known today. The factory and the whole town were burnt down by the Russians in 1719. Burnt down by the Russians in 1721, rebuilt in 1725. After the loss against Russia in 1809, Söderhamn was considered to be too close to the coast. Therefore all resources were moved to Eskilstuna (Carl Gustafs Stads Gevärsfaktori) in 1812. A list of some private works and factories, which are or have been manufacturing arms. Located close to the town of Karlskoga. An hammer mill was founded at the Bofors waterfalls in the mid 1600s. Bofors became a limited company in 1873. In 1878 Bofors announced that they had succeeded in making the first sound high quality cast steel in the world, and the Swedish Navy ordered a 4 pdr piece to test this new steel. The cast was made in 1879 and machined by Finspong. It proved to withstand a pressure of 5000 atm, compared to the 3900 atm that the strongest pig iron gun from Finspong would handle. During the following years Bofors made a couple of trial guns, witch all seems to have been quite successful. In 1983 the Swedish Navy placed its first order for Bofors guns. The first independent gun design was the 15 cm M/89 naval gun for the Göta class. In 1892 Bofors introduced its ingenious single-motion ogival breech-screw, adopted by the Navy as M/94, which put the company in lead of medium calibre naval artillery for decades. Except for an experimental gun from 1893 the first Bofors-designed field-gun was the m/10 howitzer. In 1895 the major owner, Alfred Nobel, had a powder mill built close to the original ironworks. Known as manufacturer of exelent cutlery. Started as an ironworks, limited production of guns begun in 1580. From mid 1600s to mid 1800s Finspong was the largest Swedish exporter of guns. However Finspong only made casted pig iron guns which were not competitive with the Bofors cast-steel guns or the forged steel guns from Krupp in Gearmany. Bought by an English consortium (Beardmore/Olsson) in 1900. The company was split in 1902. Bofors eventually bought the artillery division and closed it down in 1910-11. In 1902 Finspong was split in three parts, the artillery division of Finspong formed Nordiska Artilleriverkstäderna. The Beardmore/Olsson consortium sold a big part of its shares to Bofors in 1903 and some time later Bofors gained control of the whole company. It was closed down in 1910-11. Manufactured a good part of the various QF 6pdr for the Royal Swedish Navy. Stockholms vapenfabrik never had the means to manufacture barrels, so all tubes were bought from Bofors. Bought by The Maxim Nordenfelts Guns and Ammunition Company Ltd in 1886. Later owned by Vickers. Bofors bought some shares in the early 1900s and in 1906 they aquired enough shares to take control. Merged with Nordiska Artilleriverkstäderna in 1907 and all resources were moved to Finspång. Stopped making swords in 1755 (Still make very good drills though). Since 1970 Wira bruk is a museum. Located to Vira, north-east of Stockholm. From the start until the late 1700s, Wira made most of the Swedish Army's swords, rapiers and bayonets. During the Carolian era (1676 - 1720) Wira made no less then 277000 rapier model 1685, and a vast number of spare blades for the same model. Out of business in the late 1800s. Started as an ironworks, begun making guns in 1654. Lost against Finspongs styckebruk. Åkers krutbruk still makes powder though. Made guns from 1655 to 1783 circa. Historical maps from the university of Austin. An interactive map over Sweden. Last modified: February 18, 2000.